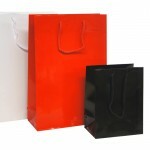 Luxury matt laminated paper carrier bags and gloss laminated paper carrier bags available in a various sizes and colours from stock. 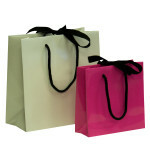 All of our laminated paper carrier bags come with matching rope handles, card reinforced base and turnover top, Every colour and size you see on our website is a stock bag available next working day on orders placed before 2.30pm. 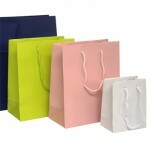 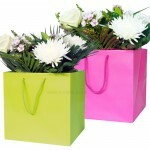 Laminated paper carrier bags are available as printed bags from as few as 50 bags screen printed 1 or 2 spot colours. 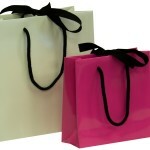 For quantities of 500 plus, we are able to offer a bespoke service for multi coloured logos and bespoke sizes. 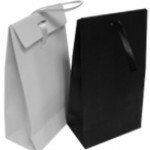 Please note that this service is based on having your paper carrier bags produced from either our European or Far Eastern partner factories, lead times will extend to 8-14 weeks subject to your requirements.